Now you can draw directly on the touch screen of your PDA. No more sheets of paper and pencils. With PDAcraft Paint, your digital assistant will not only be a gadget used for calculating and organizing schedules but a handy drawing and scribbling device. Using this program you can draw lines, shapes, icon, text, erase and copy fragments, and zoom your drawings. You can use one of 16 millions of colors. ...... You can use one of 16 millions of colors. Paint is a drawing tool you can use to create simple drawings. This program is similar to well-known desktop program Paint. Unlike desktop version, PDA version is more comfortable, because you can draw directly on touch screen with stylus. 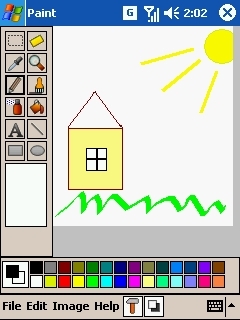 You can use Paint to work with pictures in .bmp format.Free PDAcraft Paint for windows mobile Update 2011. PDAcraft Paint is Freeware, Paint for PDA, iphone, iPad, android, Windows Mobile, Pocket PC, php. A great natural-style paint and object based graphics making program. Contain vast picture galleries for Cool Paint. A free, Open Source drawing program for young children. Image editing and photo manipulation software that run Windows. Qweas is providing links to PDAcraft Paint 1.2.0 as a courtesy, and makes no representations regarding PDAcraft Paint or any other applications or any information related thereto. Any questions, complaints or claims regarding this application PDAcraft Paint 1.2.0 must be directed to the appropriate software vendor. You may click the publisher link of PDAcraft Paint on the top of this page to get more details about the vendor.